Do you sometimes wonder how you will ever make it through a difficult circumstance? Maybe you are facing a difficulty right now and you don’t know the answer. The following true story is a testimony from a friend of mine regarding some very difficult situations in her life. She tells how she came through it all by the grace of God. When asked to share my testimony I am always reminded of the verse “But sanctify the Lord God in your hearts and be ready always to give an answer to every man that asketh you a reason of the hope that is in you with meekness and fear” 1Peter 3:15. This is my testimony of my new life in Christ and also for LIFE. I did not grow up in a Christian home. My parents both worked and as I grew they did not interact with me much. I grew up living a very selfish lifestyle. I was pretty much left to myself. I was a good example of “The rod and reproof give wisdom; but a child left to himself bringeth his mother to shame” Proverbs 29:15. I craved attention and guidance I needed from my mother and father. I went looking for it in all the wrong places. I had an emptiness that I was constantly trying to fill with something that I thought would make me happy. I went off to college and got pregnant my 1st semester. Here I was pregnant and out on my own. I had no experience with children and I was having trouble taking care of myself. I was not close with my parents so I did not know how to tell them or how to ask for help. I turned to my friends at the time. The advice they gave me was how I could terminate my pregnancy. They made it sound like it was a normal and easy thing to do, just like taking care of a common cold. This was all a LIE. In the Websters 1828 dictionary the definition of a lie is…A criminal falsehood, a falsehood uttered for the purpose of deception; an intentional violation of truth. This is exactly what I believe the deceit of abortion is. I ended up walking into the doors of a Crisis Pregnancy Center near campus. I was counseled and my pregnancy was confirmed. They called me the next day and spoke with me and prayed for me, but I would not listen. 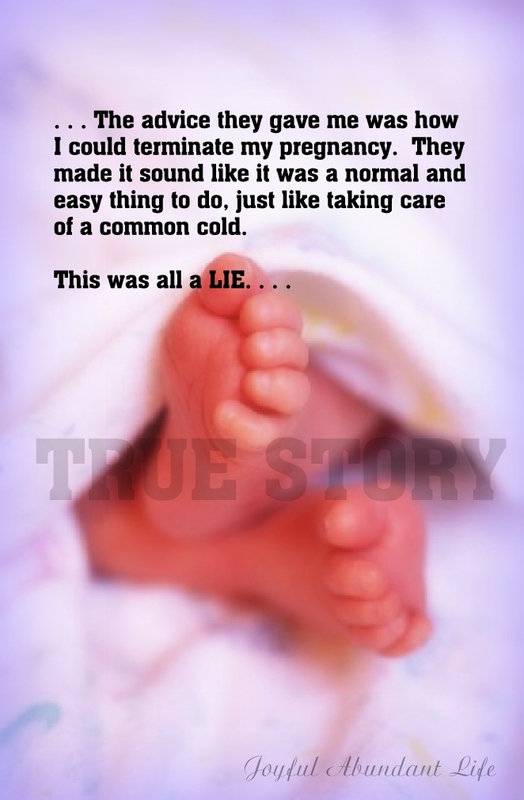 I chose to listen to the lies…sadly I chose abortion. My eyes were still blind to the truth. I realized the day of my abortion that it was not normal and there was nothing easy about it. Before the abortion took place I had an ultrasound. There was a difference between this ultrasound and the one offered at the Pregnancy Resource Center. You see the screen was turned away so I could not see. Why? Because they were trying to cover up the LIE. If I could see the truth they could not hide the lie any longer. My eyes would be open. If only I could have seen that she was a baby…she had a beating heart…she in fact had LIFE. I continued in my sinful lifestyle. I often thought about what would happen to me when I died and I just did not want to believe that was it, it really troubled me. I was in a class at the time that taught evolution and even in my lost state it sounded ridiculous to me. I could not believe that it was true. Remember the Crisis Pregnancy Center that I went to? They had prayed for me! You see there was a seed sown that day and it was starting to grow…3 years later I was pregnant again, but it did not even cross my mind to have another abortion. God was working in my heart…prayers were being answered. Early on in my pregnancy I had to have an ultrasound and I saw the truth for the very first time. My baby was alive…he had a heartbeat! Wow! When my first son was born God put Christians all around me in my life and I began to see my sinful state. I went to a women’s conference and the gospel was presented. I believed in Christ that day and what he did for me on the cross. I repented of my sins and I was forgiven! My whole life changed my desires, friends, and lifestyle. Some things came immediately, others God is still working on. “Being confident of this very thing that he which hath begun a good work in you will perform it until the day of Jesus Christ” (Phil1:6). God gave me a husband who has such a heart for the unborn and to see souls saved. Since this testimony was written, the author now has five children. It is thrilling to view lives that are trophies of God’s grace. And if we know Him, praise the Lord, we are all trophies of God’s grace! Thanks for sharing! Such a blessing to see how the Lord seeks us out. How He uses specific circumstances to show how real He is to us! I’m so glad to read this testimony and to hear of the life she’s living for Him now!!! Praise the Lord! Thanks for your testimony and your transparency! I really enjoyed your post! Thanks for stopping by and for commenting. This was actually the testimony of a close friend of mine that she allowed me to share. Thank you for being willing to be honest with such a difficult subject. I am glad you were won by God’s grace! I lived just as selfishly, but wasn’t ever in your situation because I am unable to conceive. I thought I was just lucky that I never got pregnant until I learned the truth. God’s redemption for me was part of relinquishing my goal for motherhood to Him as he brought my daughter to me through adoption. You might appreciate a few of my posts, like Packing Peanuts about my attempts to fill my heart with the world. Jennifer, thanks for coming by and commenting. This story is actually about a close friend of mine. Amazing how God works isn’t it? So wonderful that you were able to adopt. How grateful we can all be if we been adopted into God’s family.